High hope is given to Italy Mario Balotelli and Pirlo. Both performed great versus England team. Despite that, in this game Italy was up against Costa Rica as if they won the match, England was not going to be sent home early. Twisted fate occurred we were not believing there were 0 score when the final whistle blowing decided to ended the match Italy 0 - 1 Costa Rica. There were mass upset among Malaysian. You can see the chart yourself that most of the Malaysian were voted for Italy rather than Costa Rica. England never made it because Italy did not win Costa Rica tonight. Interestingly, in Mario Balotelli's Twitter tweeted that as if they won the match, he wanted to be kissed by England queen. It was a joke but million have favorite the tweet and deemed it was really funny. Besides, there were few attempt by Balotelli to strike but Costa Rica have 5 defenders at the ground strongly guarded famous striker from doing perfect goal kick or rushing. He is so famous it reminded me that his name was mentioned during press conference MH370 by Department Civil Aviation Datuk Azharuddin. A staggering number of LINE users voted Italy win against Costa Rica. 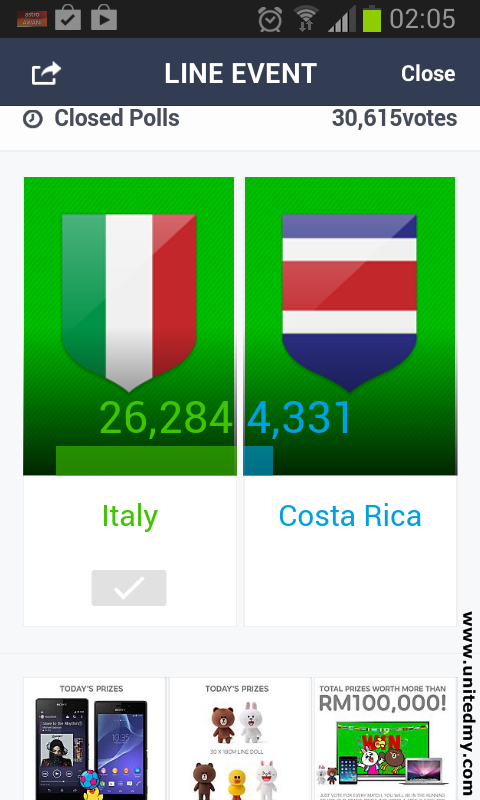 30,000 voters only 4,000 chose Costa Rica win against Italy. It further showed that Malaysian did not expected this could happen. As for those who are betting on World Cup 2014, it acted as wake up call for them. Everything in FIFA World Cup were never determinants by famous and skilled soccer players or their country development status. The next match we will see another amazing match later France vs Switzerland. Switzerland previously owned against Ecuador. As for France, they are always a solid team as we have seen in their first match. This match can be watched LIVE at RTM channel.